The big news this week is the New Moon in Aries on March 30, the first New Moon of the spring and the astrological year. Although the New Moon doesn’t take place for another week as of this post, the tension is evident already on Monday, when in just over four hours, the Moon in Capricorn aspects Jupiter, Uranus, and Pluto. These three planets have been in a volatile “T-square” configuration that is the astrological signature corresponding to the surge in global conflict, especially popular uprisings and overthrow of governments. 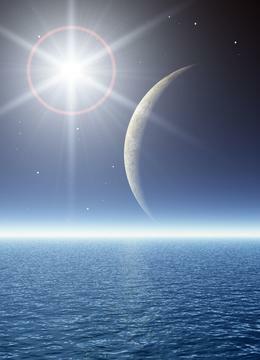 The New Moon falls less than 3 degrees from Uranus, the planet of rebellion and sudden change. Uranus in Aries is impatient and wants change now; thus the revolutions in which protestors won’t wait for democratic elections to replace rulers. Uranus also is the planet of Internet communications and social media, which political observers have credited with aiding mass movements. An op-ed article in The New York Times on Wednesday sums up the situation perfectly: Twitter is great for spreading the word about protests, but not so good for thinking through how a new government should be structured. Absent a plan, the door is wide open for foreign governments to step in with their own agendas. There’s another side to Uranus, which, when you think about it, fits with current global trends. According to some astrologers, Uranus in mundane astrology (the astrology of world events) represents not only rebellion, but rightwing ideology, fascism, and free-market economics. The protests in Kiev ostensibly were triggered by the former president’s decision to move closer to Russia instead of following a path toward joining the European Union, at a time when the EU was negotiating a sweeping free-trade agreement with the United States. In general, the world has been moving toward the right on the political spectrum, especially regarding the extent of collusion between governments and corporate interests at the expense of the working class. When major aspects involve Uranus, it’s near-impossible to predict how events will unfold, and there’s often a surprise or shock that changes the game entirely. As the cliché goes, the only thing we can expect is the unexpected. That said, I doubt we’re going to be shocked by a sudden outbreak of peace. Aries is ruled by Mars, the planet of war, who currently is debilitated and retrograde. This is a dangerous Mars, like a wounded animal backed into a corner. The one positive sign in the New Moon chart is the supportive trine (the only blue line) from Mars to Venus, the planet of peace. The trine is exact on Saturday. Perhaps there will be a de-escalation of tensions somewhere in the world late in the week. If that happens, though, I suspect that the “benefits” will be along the lines of hastening the demise of an old system, clearing the way for new, sustainable structures. Right after her trine with Mars, Venus forms a square with Saturn in Scorpio. Saturn is the planet of structure, while among Scorpio’s traits is death and destruction, often as a precursor to regeneration and transformation. With Saturn in Scorpio and Pluto in Capricorn (a special relationship called “mutual reception”), there’s a lot of breaking down in structures – societal, political, cultural – and not much rebuilding. Mercury, the planet of communications and intellectual pursuits, makes three notable aspects this week: a trine with Jupiter on Wednesday, a sextile with Pluto on Friday (late Thursday in Western time zones), and a conjunction with Chiron on Saturday (late Friday in Western time zones). Mercury currently is in Pisces, the sign of the deep psyche, the collection unconscious, and compassion for others. The trine with Jupiter in intuitive water signs is favorable for creative types, especially writers. Otherwise, it’s a good day for communicating with family, perhaps even being able to handle the more difficult family members with wisdom and compassion. Compassion literally means “to suffer with.” In more common terms, it’s about putting yourself in another’s shoes. That doesn’t mean you have to like who they are or what they’re doing, and you may choose to keep some distance. But compassion allows you to be more at peace with your own behavior and decisions. Mercury’s sextile with Pluto favors better-than-average insight, which also can help you understand issues or find solutions that may have eluded you. You may have to work to keep all of this in mind for the next 24 hours, as Mercury’s conjunction with Chiron represents deep wounds and unresolved hurt. Since the conjunction is in Pisces, memories that are dredged up might be part of your family history or even from other lifetimes. Now, I see another possibility with these Mercury transits. Recently, there has been a renewed effort to convince the White House to declassify information in a congressional report on the 9/11 terrorist attacks that implicates the Saudis. The connection has been long suspected, given that 15 of the 19 hijackers were Saudis. There also has been speculation that Saudi involvement was the real reason the Bush administration censored an entire section – 28 pages – of the congressional report. So far, President Obama has refused to make the information public, despite a bipartisan resolution in Congress asking him to do so. I thought it would be interesting to compare the chart for 9/11 with charts for the Aries ingress, New Moon, and upcoming eclipses, and indeed it was. First, the Ascendant for the 9/11 chart is 14 degrees Libra, with Mercury conjunct by exact degree. The cardinal T-square and approaching grand cross line up closely with the chart angles in the 9/11 chart (the angles include the Ascendant and Midheaven and are critical degrees in any chart). In the chart for this week’s New Moon in Aries, Jupiter is at the exact degree of Jupiter in the 9/11 chart; in other words, Jupiter has made one complete orbit around the Sun since 9/11. Moreover, Jupiter is on the Midheaven in the 9/11 chart and not far from the degree of the United States Sun. Also in the 9/11 chart, Mercury was sextile Pluto, as it is in the New Moon chart. Retrograde Mars will reach 14 degrees Libra on April 21, between a lunar eclipse on April 15 and a solar eclipse on April 29. 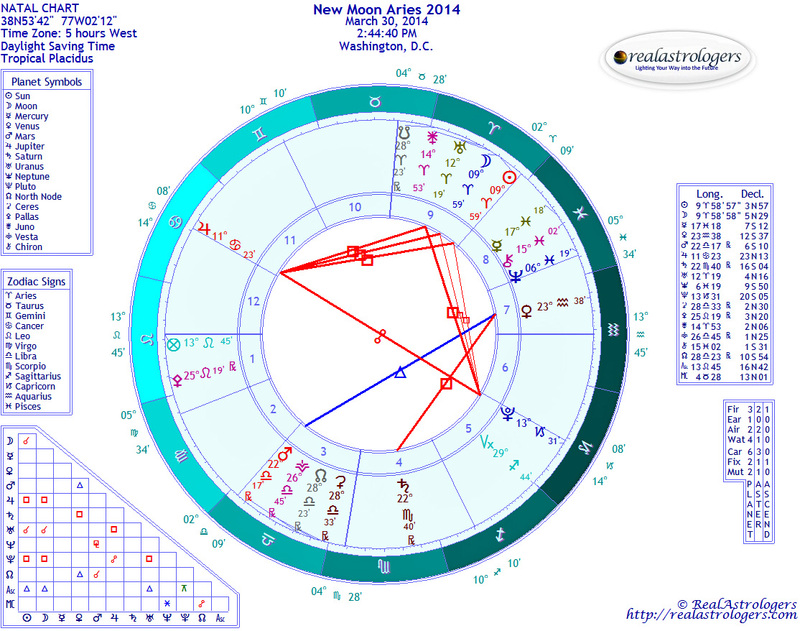 This is astrologically the stormiest period of 2014, when Mars opposes Uranus, turning the T-square into a grand cross. So what do we make of these synchronicities? First, it’s no coincidence that some of the secrets of 9/11 are coming out now. Astrology is funny that way. I say “some,” because I don’t believe that the censored section even begins to explain what really happened, and I’m cynical enough to think there could be an ulterior political motive for making the report public now. However, I do think that people will start asking some very inconvenient questions once the information comes to light. Deep probing is a manifestation of Mercury-Pluto aspects, and with Mercury is Pisces, we’re going back to an event that has become a permanent part of the collective mind. Pluto is about all things secret, including spy networks, covert operations, false-flag and black ops – you get the idea. The trine between Mercury and Jupiter occurs just as Jupiter makes a third and final pass over 9/11 Jupiter. The first was last August, when Jupiter first formed a T-square with Uranus and Pluto. Mars rules terrorist attacks, and here we have Mars retrograde (going back) to the exact degree of Mercury and the Ascendant in the 9/11 chart. The events of 9/11 were so traumatic that they left a deep wound in the collective psyche. With Mercury conjunct Chiron, there’s the potential of opening up that wound again. Some of us have long suspected that there was a lot more to 9/11 than we were being told. But there are still those who cling to the official explanation, or at least something close to it. For them, the new information could be downright painful, and it could break us apart even more as a nation until we come to grips with the implications. But that is how healing takes place – and I do believe this country needs to heal. This might be just the time to do it. This entry was posted in Forecasts, New Moon and tagged cardinal T-square, Mercury-Pluto aspects, mundane astrology, New Moon in Aries on March 23, 2014 by Pat.